Discover the rich and smooth texture of Flowerbomb Body Cream, a heavenly softness that envelops your body with a delicious scent of sambac jasmine and patchouli. Leaves a light, floral fragrance on your hair. Flowerbomb Body Cream is rated 5.0 out of 5 by 20. Rated 5 out of 5 by flowerbomblove from my favorite scent I love this smell. Men love this smell. I get sniffed all the time. Guys will stand next to me because they like the way I smell. I have the lotion and the perfumed body oil. Perfect combination. Rated 5 out of 5 by Codysoma from The best Absolutley love this cream. It is so smooth, and creamy. It is heavenly. It makes my skin feel so soft amd moist. The fragrance of this cream stays forever. It is worth every penny. It is a huge jar that last will last a long time. I use it most every night and it will last me 6 months or more. Rated 5 out of 5 by Macy57 from Fabulous This was originally a gift from a freind, I had never heard of it but I got so many compliments that when I ran out I had to find it and of course I went to Macy's first. It is a wonderful fragrance that is not too overpowering but yet lasts the day. Rated 5 out of 5 by BendOr from Flower Bomb Gift This gift for my roommate made her vacation! She was so overcome, she cried. It smells wonderful on her and makes her feel beautiful. She needs that feeling now, more than ever. Rated 5 out of 5 by GMKan from Dreamy perfume cream purchase Best used after a bath on moistened skin. Use it layered with other VR Flowerbomb products or alone before bed. Sweet dreams. 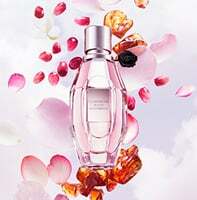 Rated 5 out of 5 by AnaJimenez08 from Flowerbomb Viktor&Rolf Flowerbomb fragrance fascinating Pomegranate style with metal details and a light pink is able to present the personality and delicacy of a woman with the fantastic scent inspired by flowers. Sweet, Light, fresh, harmonious a totally different fragrance that can take you to feel different emotions.